When the 1:1 scale Gundam was erected in Odaiba I was compelled to make my pilgrimage to Mecha. Dragonball and Gundam are the Old Testament of U.S. anime. They were the first trickle of missionaries to evangelize the gospel to us non-Japanese gentiles. In those days finding anime was like aiming a flashlight into the corner of a pitch-black cave and catching something in the light right before it skittered away. There wasn’t much anime on tap, save the rare airing of Ghost in the Shell, Macross Plus, Princess Mononoke, or Ninja Scroll. But Dragonball Z, followed closely by Gundam Wing, secured the foothold of the ensuing anime invasion. The Odaiba Gundam is from a different era than my beloved Gundam Wing though. It’s the first generation RX-78-2 Gundam from the original 1979 series, thirteen meters tall and battle ready. Well, maybe it’s not battle ready, but it does come to life for shows. It’s seriously impressive. I suffer from chronic cynicism, which the Odaiba Gundam happily doused with an attention to detail that will satisfy even the hardest to please otaku. 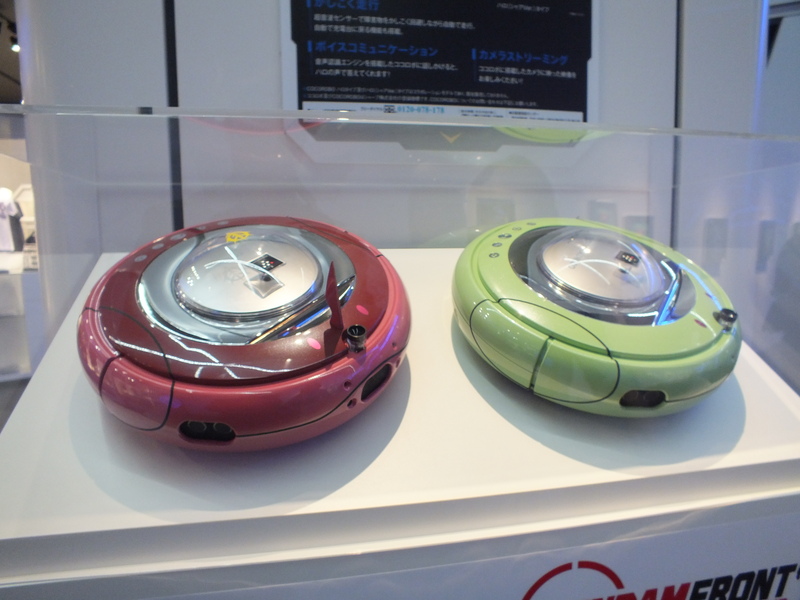 A squadron of bubble machines is stationed nearby offering overpriced miniature Gundams for 500 yen. I named mine Joe and he lives in front of my monitor between Ifrit and Chopper. There’s also a trailer nearby selling Gundam merchandise. It has a few interesting goods on offer, but I wouldn’t recommend buying anything there until you look through both the Gundam store and the cafe. Both are in the mall nearby and the quality and variety of merchandise is a bit better. Don’t be tempted. 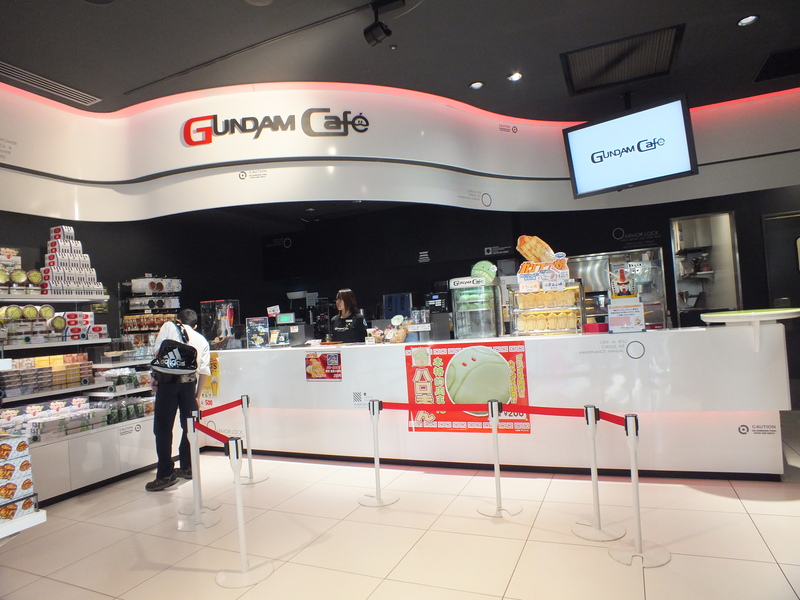 Right behind Odaiba’s Gundam is the Gundam cafe. Japan has a few of these cafes, with perhaps the one in the Akihabara the most well-known. 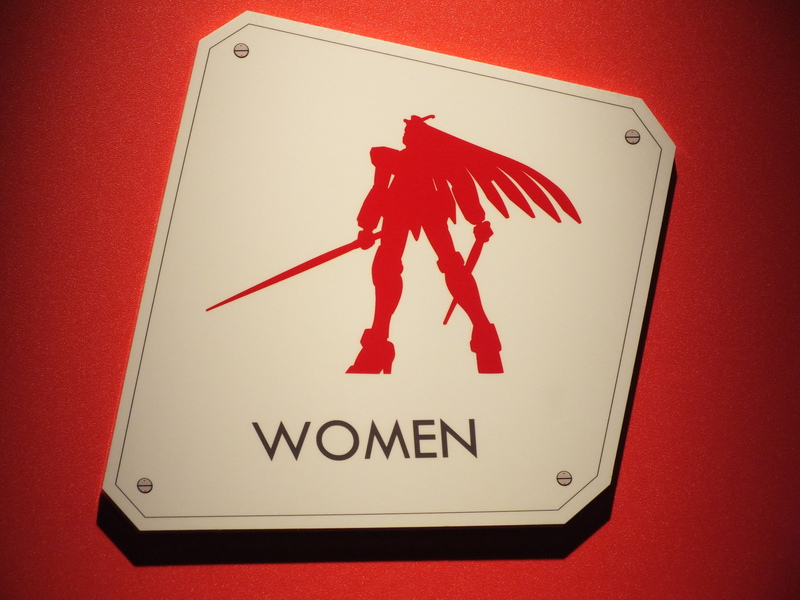 More are planned to be built, with a goal of a Gundam cafe in every major Japanese city. The Odaiba cafe offers a range of common and easy to prepare Japanese dishes, but I opted for simple taiyaki and coffee. Taiyaki is sweet bean paste baked inside a warm crust. It’s found everywhere Japanese merchandise is sold. (Like how you find cotton candy at every carnival.) Don’t be put off by the word “bean,” either. The Gundam-shaped teriyaki in the cafe was surprisingly good. You’re also not Japanese until you try it. The coffee also gets special treatment. It’s dusted with one of several Gundam-themed faces in chocolate. The taste is passable, but I recommend ordering one so you can go sit in outside and leisurely enjoy the view of the Gundam over a coffee. (There’s also almost no seating inside, so sitting outside is your only real choice.) You are the presence of historic anime brought to life, so remember that even the best-laid vacation plans can be ruined by rushing to see and do everything. In my opinion, the way to enjoy a vacation is to take time to savour it. A good vacation leaves you feeling relaxed (or at least satisfied) once you arrive back home. 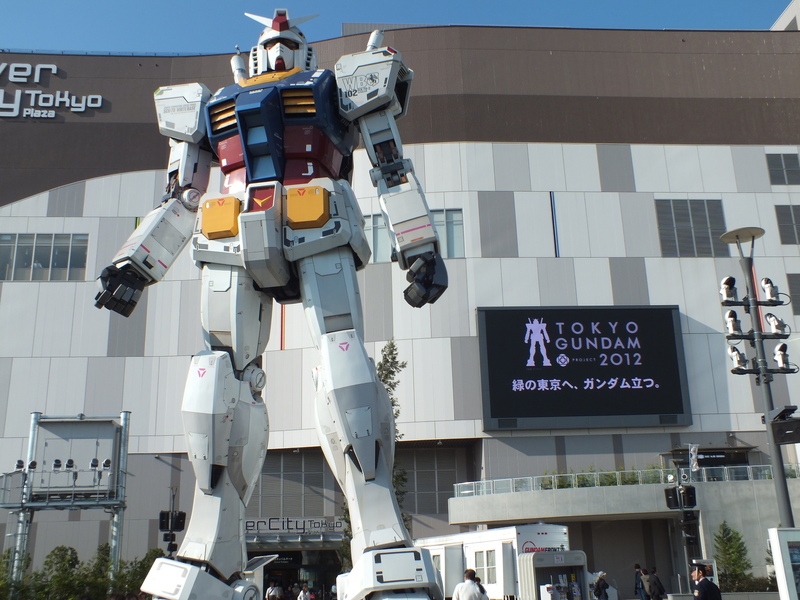 Take your time to enjoy Odaiba and its Gundam instead of hurrying to see and do as much as you can. After a quick meal at the Gundam cafe, head into the shopping mall. 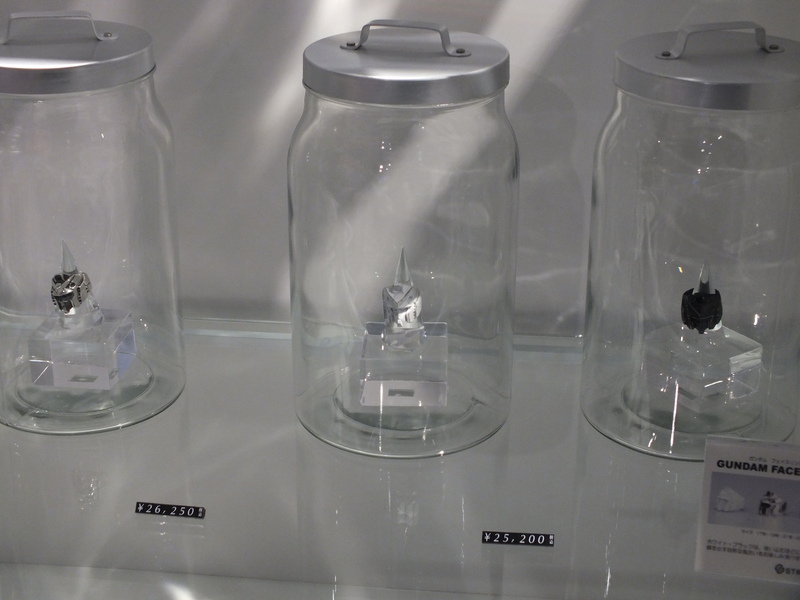 Your non-otaku significant other can leave you chained up at the Gundam museum while they go shopping. Just make sure you have them take a picture of the opposite gender’s bathroom sign before they leave, because, you know, it might be awkward if you went in there with a camera. While their gone you can enter the model showcase. 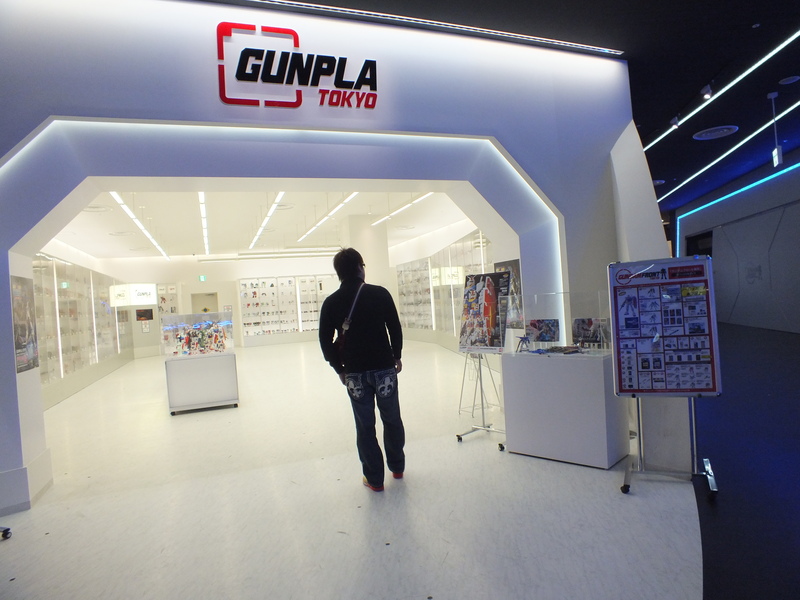 Called, Gunpla Tokyo, the storefront has a lot of “master grade” Gundam models, meaning they take at least a month to complete. Gundam models are like model cars and airplanes in the West: every Japanese guy has made one. They’re like hundred-piece sets of otaku culture. They make great souvenirs for any otaku. Odaiba’s Gundam museum, I’m sad to say, I did’t enter. I had burned too much daylight at the bank that morning talking to some very “helpful” staff who, after an hour of pushing documents on me, told me very politely that they “couldn’t complete my transaction at this time.” Customer service is excellent in Japan, far superior to anything back home. However, when you purchase anything of significant value, it’s the staff’s duty to spend a lot of time with you. If you speak a decent amount of Japanese, the staff can keep you there much longer than is acceptable in the west. Since this was a day trip and she wanted to spend time elsewhere, this cut a healthy chunk out of my time in Odaiba and viewing its Gundam. The Odaiba Gundam is a priority stop on any otaku’s Japan tour. Unlike Akihabara, it’s a great place to bring along a non-otaku as well. The giant shopping mall right behind the Gundam is filled with both cheap and designer clothing stores, so even the most fashionable significant other will come away feeling like they’ve done more than just indulge your otaku nature. Odaiba is a happening place. There’s plenty to do even without any interest in Gundams.